I'm not a computer wizard or HTML person at all, just a resourceful and persevering learner who's always very keen to improve as best as I could, from online or elsewhere. Having recently upgraded my oldest blog's template to a newer version, I'm dazzled by all the new blogger layout features made available to us all. Simply awesome. And, as I learn and try out more of these fantastic features, html and other related matters the hard way through much trial and error, I strongly feel that it's such a waste if I don't compile, document and share them. Knowledge is no good unless shared, right? Some of them could appear too simple to do, to some bloggers perhaps, but if you're not exposed to them or have not attempted thus far, they can be very intimidating. I've realized this for a fact, as I continue to teach a friend who's new to blogging. Even as simple as how-to create a blog can be so daunting or seemingly impossible for newbies. Thus, I've decided to do just that...try my best to share whatever I've learned along the way, from the very basics and will include some handy blogging tips, tricks and techniques whenever I can. This is also another way of improving myself and to acquire more knowledge and hopefully be more competent in blogging, html and blog design. Moreover, I always believe that there's much joy in sharing than receiving! 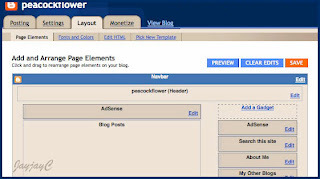 That's how the idea of creating another blog, specifically for this purpose was conceived. 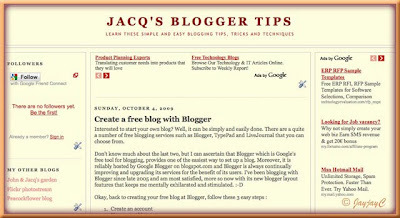 Ta...da...here it is, the creation of my newest blog, Jacq's Blogger Tips! Aspire to put a smile on someone's face each day! Happy blogging! Comments and feedbacks are most welcome and appreciated.